Experience Shows that Asset Tracking is Worth it Chaos in a data center is simply unthinkable. Reliable processes, complete documentation and absolute order are some of the basic prerequisites. But from a certain point, people start to lose the overview. Nevertheless, the numerous computers, servers, storage devices, switches, patch panels and network cabinets have to be managed perfectly. This is why automated IT asset tracking is essential. Finances: Financial accounting requires a complete overview of the company’s assets. IT asset tracking helps to create precise and up-to-date lists. Documentation: Experience shows that, over time, errors start to creep in when manual methods are used. IT asset tracking with systems available today automates, digitizes and perfects the documentation. The systems capture operating data, share information, know the capacities, manage the inventory and support management. Quality: Quality and asset management (e.g. ISO 55000) require regular audits. An IT department will cut a convincing figure in every audit if it practices good asset tracking. Geography: Those responsible often work decentrally or not where IT is situated. They can still have a real-time overview with asset tracking. Outsourcing: More and more external specialists are coming into data centers because services have been outsourced. Asset tracking supports monitoring in such cases. Knowledge: The planning, operation and control of IT are often based on the knowledge of just a few people. What happens if these privileged few are not available? Asset tracking makes detailed knowledge available to all those responsible at all times. Process: An asset will typically pass through more than a dozen areas of responsibility from being purchased to being decommissioned. Along this path there can be misunderstandings, inefficiency and mistakes. Only carefully carried out asset management can reduce or even exclude such problems. IT asset tracking is the basis for this. 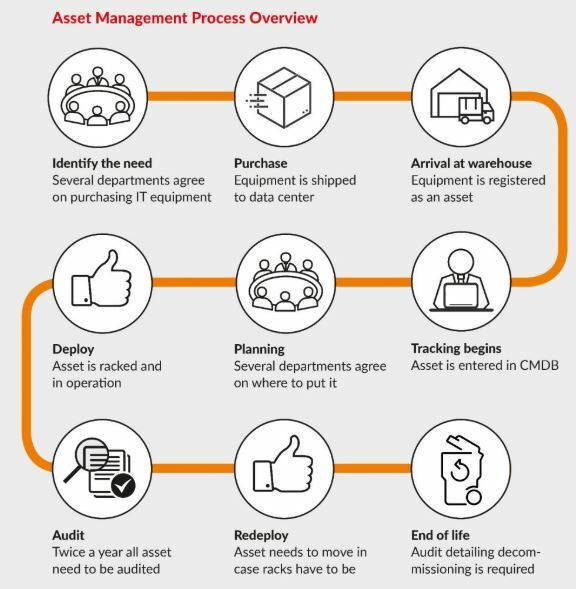 Life cycle: Automated IT asset tracking extends beyond one particular moment in time. It covers the management of the entire life cycle of devices, networks and everything associated with them. Decommissioning: Obsolete hardware is simply ignored or forgotten about so as not to have to disturb the operating procedure or endanger service level agreements. The decommissioning process would be taken care of in a flash with continuous asset tracking.